Penguin Books, 2014. 366 pages. Sasha Karnokovitch, a lowly professor of atmospheric sciences, is the son of one of the greatest female mathematicians of all time. The book opens when his mother is dying. His family shows up at her bedside, but he knows that many more people will arrive when she dies. When my father warned of the horde of mathematicians that would descend upon our house after my mother’s death, I knew what to expect. They would be grieving, but not like my family. They would be mourning not my mother but the loss of ideas, the loss of intellect. They would no longer be able to sit in a room with her and feel the magical presence of someone with the talent to find the hidden gem in what is thought to be all dross. The Hasidic Jews have a word, dveykus, for men who always possess the spirit of God inside them. My mother, unlike my grandfather, did not believe in such things literally, but when it came to understanding mathematics, she knew that she possessed the equivalent of dveykus. Like a rebbe with acolytes who feel blessed just to be around someone whose goodness and spirituality are always present, my mother had her followers. I had been with them all of my childhood. They sought me out for my secondhand dveykus even as an adult. Now they would come and I would have to be their gracious host for seven days, the days of shiva that are a traditional part of Jewish mourning. My uncle called them the szale?cy, the crazy people. Yet he would supply the vodka, and soothe them in his own way. This book is about that shiva. Indeed, the mathematicians descend, especially those, like Sasha’s mother Rachela, from Poland and Russia. They are convinced she proved the Navier-Stokes Theorem before she died. But where would she have hidden her work? They will search the house; they will interrogate her parrot; they will even work together to try to prove it themselves. This is a rambling novel, with quirky characters, mostly academicians. There are stories of Rachela’s childhood during World War II and stories of how it was for Sasha growing up as the child of a genius. There are family stories and mathematician stories. 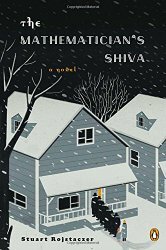 Having been in a math graduate program myself, even though this novel wasn’t a page-turner, I kept coming back to it and couldn’t resist reading about the world created here – about genius and math and family and fate and love and faith and recognition and whether cold weather helps you think clearly. Source: This review is based on a signed copy I got at ALA Annual Conference. This entry was posted on Friday, August 14th, 2015 at 5:27 pm and is filed under Contemporary, Fiction Review. You can follow any responses to this entry through the RSS 2.0 feed. You can leave a response, or trackback from your own site.